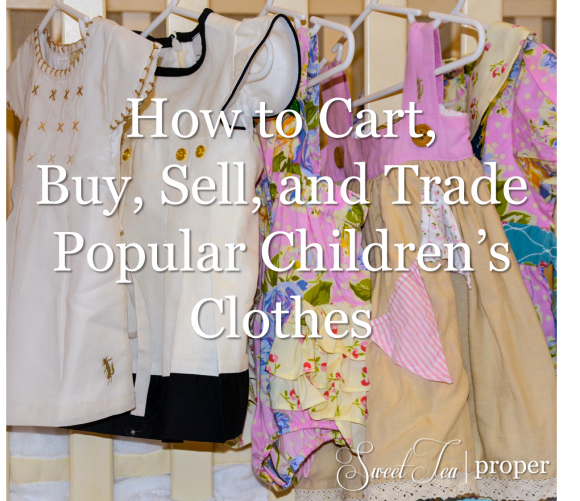 How to cart Well Dressed Wolf, SweetHoney, Matilda Jane, and other children’s clothing brand favorites! It’s 7:57pm and your heart is beginning to race. You’ve already downed one Viniq mixed drink and would like to make another, but you can’t turn away. Your husband and children can’t find you. It’s 7:59pm. REFRESH! REFRESH! REFRESH! 8:01pm. Sold Out. What? How can that be? But I was so fast! This crazy world of “carting” is something I didn’t understand until I became a mother. Even then, I didn’t get it until I carted my first piece of clothing – the Parisian Beverly dress by Well Dressed Wolf. The dresses from popular online stores like Well Dressed Wolf, SweetHoney, and Matilda Jane typically retail around $40 – $60 per dress or outfit. The dress that you see above (adorable, right?) cost $56.50 after shipping. Now wait for it…as of this writing, the resell value for the same dress (even used!) is currently between $120 – $160. Talk about a good investment! So, let’s discuss what’s going on here and how you too can get a good deal on brand name clothing for your little ones. Want to get the same excited feeling as carting for about a quarter of the cost? Let us help you create something equally beautiful! We are adding new techniques and tutorials to our Sewing Basics page and Tutorials page. Here’s the link to our Hot Air Balloon dress that we think you will love! Sign up for our e-mails or like us on Facebook to be the first to know when new posts are added! Continue on for How to Cart because even the best sewer can’t resist some of these beauties. Carting is simply the process of purchasing a good from an online store. Simple enough, right? Not quite. For sought after children’s boutique clothing, many mamas believe that carting can be downright impossible or at least left to luck or an insanely fast internet speed. You might be asking yourself, what makes these clothes so special? It is as simple as supply and demand. 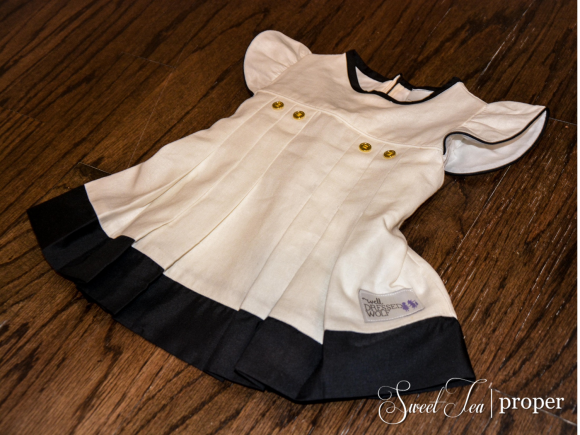 For a load (here’s another lingo word for you), the online store might have 500 dresses available in various sizes from 6m – 8y (sometimes larger). The number of people trying to cart one of these dresses is unknown, but with 80,000+ Facebook page likes, you can imagine that it is more than 500. Some people cart to keep and some cart to resell. Sometimes a person may even cart the wrong size with the hope of trading it for the size needed. For many people, half of the fun is the burst of adrenaline (seriously!) from trying to cart. If you are a carting mama, you know what I mean! If you’re not, at this point, you are probably thinking that this is insane. Once you’ve successfully carted you can keep the item, sell it on one of the resell boards, or trade it for a different size or style. It is through the BST (Buy Sell Trade) community that you see the $60 dress RV (Retail Value) resell within minutes of purchase for $120 MV (Market Value). Trust me when I say, this would be a steal for some dresses. I’ve seen several $50 dresses go for $250 recently and a friend of mine saw a OOAK (One of a Kind) go for $2,200. You might think that this seems unfair or even crazy, but that’s the way free market works and it can work in your favor too. Most of the BST groups on Facebook are Closed so generally, you have to wait a little while before being accepted. If it’s been several days since your request and you have a friend in the group, ask them if they can reach out to one of the board administrators. This will usually speed up the process. To find the right group for you, type the brand name that you like in the search bar. Usually, you will see the fan page for that specific brand as well as resell pages. Group members beware! Once a member of the group, certain (typically negative) opinions must be kept to oneself. The price of that dress is ridiculously high! Save the rant for your friends. Complaining or even discussing the price of a listed item can get you kicked out of most BST groups on Facebook. General rule: If you don’t like the price, look somewhere else. – Writing Sold or giving your PP (PayPal) information via comment or private message and backing out. – Not listing items properly. Each group has its own rules on what’s required and acceptable. READ THE RULES! – Being a shady seller. – Being rude. Yep, if an administrator thinks you’re bringing down the group, you can get kicked out. For any new carters reading this, you’ve probably noticed there is a special lingo. 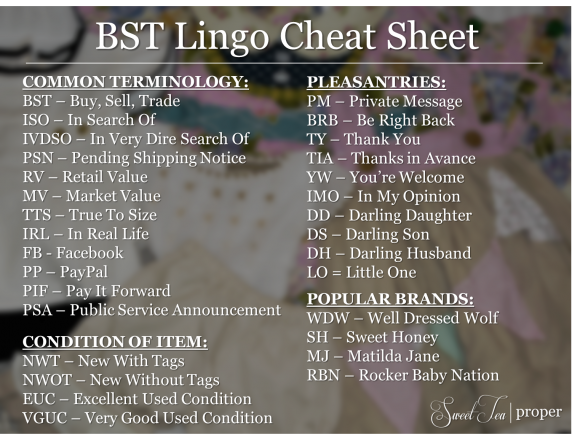 Below you can find the most common Buy Sell Trade (BST) Vocabulary and Acronyms as well as a Cheat Sheet that you can pin for later. The majority of clothes sold from Well Dressed Wolf, SweetHoney, or Matilda Jane can be resold (even used) for at or above retail. That means that you can technically dress your child in expensive popular clothing for free (by selling it for what you paid for it) or possibly even make money on it – assuming your DD (Darling Daughter) managed to keep the item in at least VGUC (Very Good Used Condition). However, if you are like me, you will sell your husband on this concept, but then never actually want to part with any of it. Now, you know that your chances of reselling for what you paid for an item (or more!) are going to be better if you pay the lowest amount possible. In most situations, this means you have to cart the dress or other piece of clothing being loaded. With these brands and others, as long as they remain popular, you will almost always find the lowest price by buying at retail. Since carting is hard (remember 500 dresses, 80,000 fans) we’ve come up with a few tips to help you become a successful carter (or ninja carter, as the most successful ones are called). – Check your internet speed. If you want to cart, you’ve got to be fast. Some people have upgraded their internet simply to increase their chances of carting. – Computer / Cell Phone / Tablet? It doesn’t matter. People have carted from all three. If you’ve been unsuccessful with one, try a different way. This one change helped me go from zero carts to four in one month. – Ditch Internet Explorer. Although debatable, IE is definitely not the fastest web browser. We prefer Google Chrome. – Clear your browsing history. A clean slate allows your browsing to scan quicker. – Sign in before the load time (you should already have your account information set up before the load). If the load is at 8:00pm, you should be signed in by 7:50pm at the latest. – Have your credit card number copied and ready to paste (ctrl+v). Also, have your credit card expiration date and security code ready to enter (although it’s not necessary to pre-copy it). – Know which line the load is going to fall under. Sometimes the product being loaded will pull up on the Shop or Shop All tab, but other times it goes under a specific line. You have seconds to score a piece of clothing. You absolutely have to look in the right place. – Start refreshing the page about a minute and a half until the load. If on a computer (F4) usually does the trick. – Don’t hesitate. It’s usually cheaper to cart the wrong size and try to find a trade then buy at market value. Once the product loads, click and checkout. – Keep trying until the product says sold out. One of the most frustrating parts of trying to cart is selecting your size and quantity, selecting checkout, and the next screen informs you that there are inventory issues. This means that size is already sold out and for some of the brands this happens in under 10 seconds. Although it has never happened for me, other carters have been able to purchase the product several minutes after the sale has begun. This happens when someone has a product safe in their cart (by making it to the payment screen) and then decides against making the purchase. – Finally, have fun! Carting can be stressful and addictive (seriously!). Try not to get too discouraged and you’ll be just fine. To close out our introduction to carting boutique children’s clothing, we are going to have our first ever giveaway. 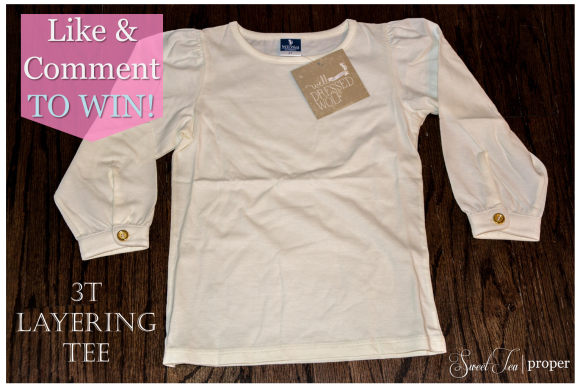 As a thank you to our readers, we are going to be giving away our most recent carted item – a 3T ivory elegant layering tee from Well Dressed Wolf. There are two ways to be entered to win the Well Dressed Wolf tee. First, share your favorite children’s brand in the comments section below. Make sure to include your email or we won’t know how to contact you. Second, if you haven’t already, like our Facebook page. Under the “Like to Win Post”, like the post and tag a friend in the comments section. On Friday, January 2, 2014 at 12:00pm (CST), the contest will be closed and a winner will be randomly selected. Good luck!